Everyone loves to celebrate a job well done, and knowing your graduation gift etiquette will steer you towards the right gift for your graduate's accomplishment. Anyone with young people in their lives is bound to be celebrating graduations of many different kinds, and appropriate gift etiquette expresses both your pride in your loved one's achievement and your good taste. Gift etiquette for graduates starts with knowing whether or not you are expected to present a gift. If you receive an invitation, graduation etiquette dictates that you should either arrive, or send your regrets, with a gift. Note that you don't have to do anything "big" – something thoughtful and useful goes a long way. If you receive a graduation announcement, you are not obligated to send a gift, although you may. Sending a card or note with your good wishes is never a bad idea. Some people keep these in a bundle for the graduate as keepsakes for the future. Gift giving etiquette is tied to the graduate's level of accomplishment. In most cases, a high school graduation is the most celebrated type of graduation, but if you have young family members, you'll be made aware of graduations from Kindergarten, elementary school, and junior high as well. These smaller graduation events usually don't merit more than close relatives and close friends, and can be rewarded based on the parents' guidelines. For a young child, a card or a small gift of cash is all that is necessary--a graduation is not a birthday. Good gift choices for young graduates are school supplies such as pencil toppers, locker mirrors, backpacks, or watches. For the high school grad, the celebration is a pretty big deal. In modern western culture, a high school graduation is also a rite of passage into adulthood and responsibility. Choose graduation gifts based on their relevance to your graduate's future plans. Good gift choices for a college-bound grad include alarm clocks, desk lamps, and college dorm household items. Graduations from college or post-college education are celebrated less frequently with large parties, but these accomplishments are distinguished, and should you receive an announcement or invitation to one of these events, it is appropriate graduation gift etiquette to reward the graduate with a gift of either cash, or a gift appropriate to their major or future employment. Gifts can range from the expensive, such as a briefcase or portfolio, to the more modest, such as a planner, datebook, or a personalized desk item. Gift etiquette is also related to your relationship with the graduate. Graduation party guest lists often include a range of guests from close relatives to distant acquaintances. Appropriate gift etiquette dictates that you should leave the lavish gifts to the close relatives of the graduate. If you are a close relative, and you wish to express your pride with a large or expensive gift, look for something that is meaningful to the recent grad's future plans. While the "graduation car" is a staple of teen movies, it's a big responsibility with many associated expenses in real life. It's best to leave that gift for the graduate's immediate family. 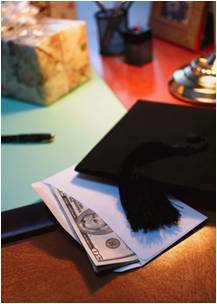 It's very common to present cash gifts to recent grads, especially high school graduates. A cash gift can be whatever amount your budget can afford, although it is customary to leave the large donations to close relatives. Ten or twenty dollars is an appropriate cash gift for a grad. It says congratulations without making anyone uncomfortable. It's also appropriate to replace cash with gift cards, if you wish to provide a little direction with your gift. The most important thing to remember in graduation gift etiquette is that your gift should be a sincere expression of your best wishes for the graduate. Your gift need not be lavish to be appropriate and greatly appreciated.